Korean American community groups are calling for a boycott of the restaurant. In New York, several Korean American community organizations are calling for a boycott of a McDonald's restaurant in Queens after an employee was caught on video hitting a Korean patron with a broomstick, and allegedly refusing service and shouting, "We don't serve coffee to people like you!" 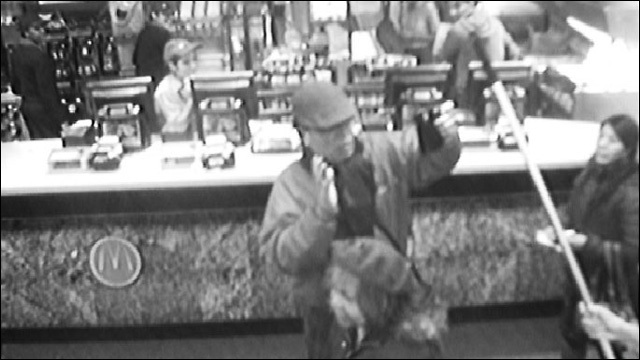 The incident occurred last February at the McDonald's location on Main Street in Flushing. The customer, 62-year-old James Jin Kim claimed that the employee, Rooshi Sajjad, attacked him after he complained about the slow pace of service. In response, the employee yelled at Mr. Kim, and told him "Get out of my restaurant!" When Mr. Kim began recording video on his phone, Sajjad attacked him with a broom handle. The police were called to the restaurant, and Sajjad was arrested and charged with attempted assault and criminal possession of a weapon, both misdemeanors, and one violation, harassment. In August, she accepted an offer of adjudication in contemplation of dismissal, which means her record will be cleared if she stays out of trouble for another month. She reportedly still works at the McDonald's. Call me crazy, but shouldn't attacking a customer with a broomstick be fairly clear grounds for getting fired? And what about the "people like you" part? Meanwhile, Mr. Kim filed a lawsuit against the restaurant, seeking $10 million in damages for unlawful discrimination, civil battery and assault, the intentional infliction of emotional distress and negligent supervision. In addition to Ms. Sajjid, the complaint names McDonald's Restaurants of New York Inc. and McDonald's Corp. While the incident happened nearly eleven months ago, Mr. Kim's attorney obtained the surveillance video and publicly released the footage last week, sparking renewed outcry within the local Korean American community. 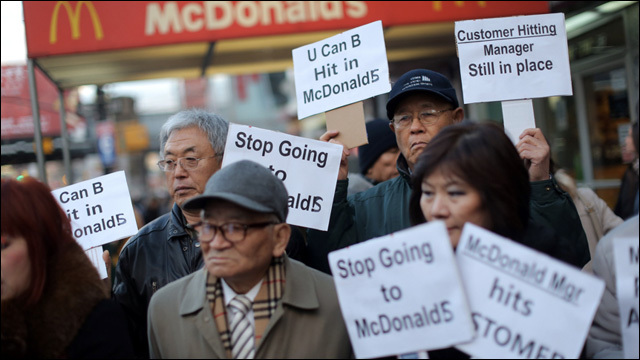 Several groups staged a protest rally outside of the McDonald's, demanding that the restaurant train its employees to be more sensitive to Asian patrons. This isn't the first time a McDonald's restaurant in Queens has drawn the ire of local Korean Americans. Last year, another Flushing location found itself pitted against a community of elderly Koreans who regularly frequented the restaurant -- far too frequently for McDonald's management, who called the police on multiple occasions when they felt customers had overstayed their visits. That conflict, which made national headlines, was eventually resolved when local politicians got involved to broker peace. This one is probably going to take a little more effort to smooth over.